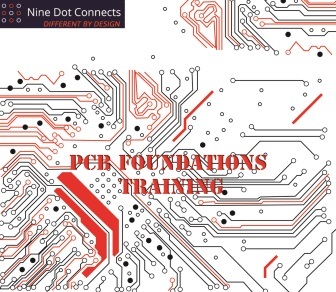 In early 2016, we at Nine Dot Connects made the decision to invest our resources into a class that would teach the PCB process. From the conversations we were having with our customers and from what we were observing in the industry, we believed that we had identified what Malcolm Gladwell called the ‘tipping point’. It would not be long before the industry recognized that skills and knowledge training was needed for those who were willing and able to learn the art and process of PCB design. From what we see today, we were correct. We created the PCB Foundations course from scratch by gathering the knowledge and experience of our senior staff and putting that knowledge together to form a complete training from one of our experienced instructors, exercises to re-enforce the learning, and a comprehensive reference guide to use long after the training has been completed. With over 1500 man-hours expended on this course development, we are expertly equipped with the necessary skills to help you become well versed in the art of the PCB design process. It is simply asinine to assume that any electrical engineer just out of college would be versed in the design or process of the PCB. In fact, there are very few classes taught at any colleges or universities on this subject, and if offered, are not included in the engineering curriculum to fulfill graduation requirements. Such classes are generally treated as extension courses for those who have recently or already graduated. The subject may be taken up by a student who is doing an independent study or senior class project. All too often that student is learning the art on their own with no guidance. The art of PCB design should not be mistaken as a low-level task. Thirty years ago, the layout could have been given to a savvy technician who had nothing more than a high school degree; however, with the complexity of today’s high speed circuit designs, the engineer must now own the full PCB design process. As we have seen time and time again, when the design team does not understand and control the complete process, the process owns the design team. This is NOT a tool course. Though EDA tools make up +75% of the design process, taking a tool class will not teach the process (skill vs. knowledge). EDA tool classes were designed to show the functions of the tool. Unfortunately, there are many features in these tools that allow the creation of unmanufacturable designs. This is NOT limited to just PCB layout. Although we at Nine Dot Connects have great admiration for the work done by the IPC and its CID certification class, we believe focusing on the mechanical fabrication and assembly requirements related to PCB layout is short sighted. Many issues that arise on the manufacturing floor come from design issues in the schematics, specifications (and lack thereof), documentation, and bill of materials. “The material was a very good and detailed overview of the entire PCB process. Good resource of information for beginners as this information isn't really written down all in one place... until now. The practical, real life examples are always good. A lot of details. It's all about the details. Wish I had this 16 years ago when I started." A Complete walk through of the PCB Design Process - The PCB Foundations class was designed to walk you through the entire PCB process. In fact, the first day of the class focuses on the manufacturing process. How can we design for manufacturing if we don’t know what is possible, expected, or permitted? Manufacturing Documentation – The PCB Foundations class focuses on the documentation necessary to get the design into manufacturing. By the conclusion of the class, you will know what documentation to produce and the best practices to ensure the documentation is readable by the manufacturing staff and the equipment they are using. Library Etiquette – The PCB Foundations class goes into the details of both the symbol and footprint libraries to ensure that the end documentation is consistent. All documentation leans heavily on good libraries, and good libraries are always consistent! Schematic flow – The PCB Foundations class demonstrates how schematics can have a flow which provides a great deal of readability to those who review it or use it in the labs for debug and test. PCB Flow – The PCB Foundations class provides a structure for systematically setting up the PCB layout and providing recommendations to avoid costly mistakes. This course was designed for those who have anything to do with the PCB design process, from specification to the completion of layout. This includes, but is certainly not limited to, designers, engineers, program managers, technicians, and even purchasing agents. Knowing the complete process can create bridges and tear down the silos within organizations. Those on the manufacturing side of the PCB process are certainly invited, as it will give an overview of the process from the designer’s point of view. However, for those well versed in the Printed Circuit Board Assembly (PCBA) process please note that this is truly a fundamental course of the entire process. Manufacturing specifics such as tolerances, IPC specification driven requirements, and material characteristics are not covered. "Thanks for an awesome private training on PCB layout this week. I learned a ton. Now that I’m back, I think I have to pretty much trash a layout that I was working on. I basically designed an un-buildable board. It’s not ALL bad though. I am happy with my component placement and I have a pretty good sense for how routing has to flow for the design." Even if you are not using the tools mentioned above, it is not necessary to know them for the class. The fundamental concept for these classes are the same. Our training exercises were developed to immerse you into the entire design process. Each exercise not only reviews the knowledge that was presented, but also presents real life PCB process challenges. This aspect of the exercises fosters thoughts and discussions with your fellow classmates and the instructor, empowering you to use the knowledge of this course immediately in your daily work life. This course is taught by our senior engineers who have years of experience in PCB design and design flow. The reference manual is not a bunch of PowerPoint slides; it is a book all on its own, one that we plan to expand to become the de facto PCB reference guide! We want this book to be the Horowitz’s and Hill’s The Art of Electronics for PCB. You will be provided with a training reference (281-pages) and exercise manual (55-pages). This course (PCB Foundations) helped me fill many knowledge gaps. I never knew the details of the whole PCB design process. This was never taught at my University, and I had to learn about the PCB process by myself. The course helped me understand each step of the process in a detailed manner. I thoroughly enjoyed the course and Dan is an outstanding instructor and was available to answer all of my questions and concerns. I hope to take other courses in the near future. The material (PCB Foundations) was a very good and detailed overview of the entire PCB process. Good resource of information for beginners as this information isn't really written down all in one place... until now. The practical, real life examples are always good. A lot of details. It's all about the details. Wish I had this 16 years ago when I started. "The PCB Foundations class was great for me as an experienced EE, but without experience in PCB design & fabrication. I would recommend the class to anyone interested in learning more about the details of how PCBs are made and the process for getting [that circuit] onto a PCB. Do not be intimidated by the technology, the instructor and this class will educate you no matter your current familiarity with PCB design."